The nominal index is now 37% above its 2000 high, and over the past 65 years it has risen at an annualized rate of about 7.7% per year. The trend lines I've drawn represent annualized growth of just over 6%. In inflation-adjusted terms, over the past 65 years the S&P 500 has risen at an annualized rate of about 3.9%. 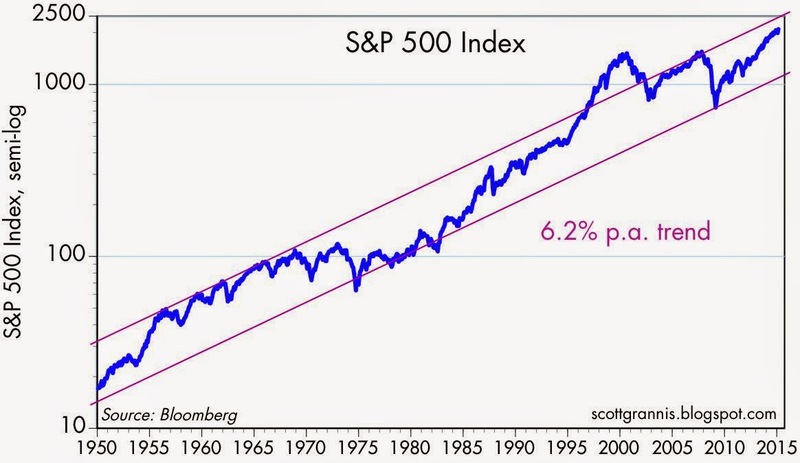 The trend lines represent 3% annualized growth. The CPI has risen at an annualized rate of 3.6% over the past 65 years. Technicians can argue all day about what this means. In my view, I don't see anything unusual going on. Stocks can be very volatile over shorter time horizons, but over time they do pretty well. 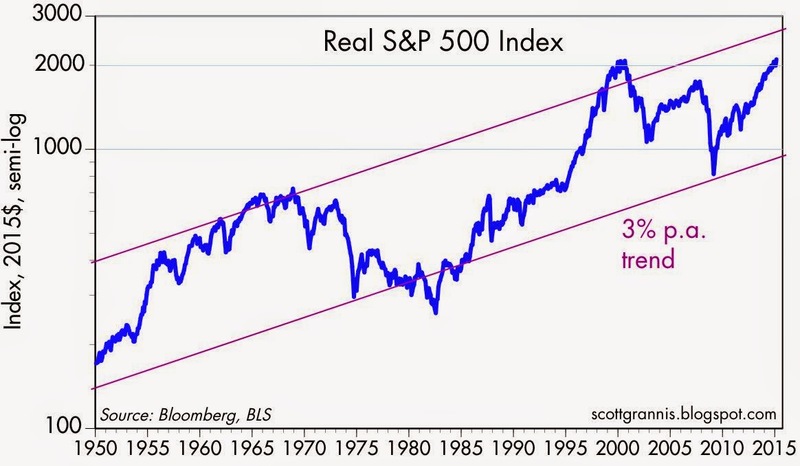 Keep in mind, as shown by the charts, one can go 30 years to regain an old high, ala 1965-ish to 1995-ish. Or 15 years, 2000 to 2015. When I am in a better mood, I am optimistic that the best days are ahead. Corporate governance is much improved in the last 30 years, and the emergence of the merger or takeover market means undervalued companies get bought. My sense is that corporate management is better than ever, if only due to stock incentives. Strange how the world has gone full circle since Ronald Reagan days. He called the US "the last best hope." In many regards, he was right. Then the Soviets collapsed, and China appeared to modernizing. Europe was moving away from socialism.The world looked bright in the 1990s. Now, it seems China and Russia are nothing but crony capitalist thug states and getting worse, and Europe sinking into tax-regulatory muck. South America and Africa are hopeless, and so is all of Islam. The US is the last best hope again? I sure hope the stewards of this nation the USA think a long time about how to keep it going. Ben's comments are on the mark. Crony capitalism also appears to be rooting itself in the US too. Growth will be harder to come by in the future because of this. The bond markets see it that way, but not stocks...time will tell. PD---I should have been a little more positive. I think Japan and South Korea and Australia also have bright futures. Possibly even India. Thailand maybe.Canada looks good. I have been reading for years now that japan's aging and homogeneous population and will permanently reduce future wealth. no? Japan needs more babies! It is true. They probably need to raise the retirement age too. Some advocate more female labor participation. But what nation-- very low crime rates, very high tech, press freedom, democratic elections, improving environment. Toyota has introduced a fuel-cell car, the Mirai. Compare Russia or China to Japan. They look like monkey-thug backwaters. And now Japan has a central bank concerned about real growth. Keep your eye on Japan. I'm pretty sure japan is also extremely racist. demographically the opposite of the US. hard to see where the growth is going to come from. The innovation coming form Israel is creative, strong, and in some cases industry changing. The synergies with other growth countries good be very good.